Conventional wisdom states that Latinos are conservative and compassionate people. When I first read the article posted on The Hill, titled: Five Surprising Things about Latinos and Abortion, by Maria Echaveste, former Deputy Chief of Staff to President Clinton, I remembered those times when I am told by many liberal advocates that I do not speak for the entire Latino community. Many times I am told that not all Latinos feel an allegiance with conservative beliefs as I do. My comments, they say, should be stated in the third person, thereby, representing an impartial view of the Latino community because not all are in agreement with my conservative values. Oftentimes, I shrug off these comments because as I am in the Latino community day in and out, I encounter Latinos, Latinas, on many occasions who want to sit with me and talk about the role of Latinas in the professional world, in politics, and in family. 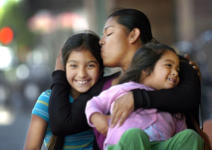 Latinos want to talk about values in their community, family, and lives. By the end of our conversations, we realize how socially conservative we Latinos are, and then I think about those who say that social conservative views are not the conventional Latino values. In her article, Ms. Echaveste states that Latinos are sympathetic to abortion and in the right to have an abortion. In fac,t she states five points about how Latinos “are more complex and nuanced” than many political and elected officials currently believe them to be. She further states Latinos are very supportive, empathetic, and will go against church leaders about abortions. Finally, she states that we are fair minded and accept it as a reality in lives of Latinos. Latinas are, like many women, nurturing and will defend the rights of other Latinas when it comes to empowerment. Latinas, are also prone to mentor younger Latinas, so as to avoid pitfalls and ensure that mistakes are not repeated over and over to a point that they are no longer mistakes, but bad choices. I speak about these things from experience, as a daughter, a sister, a mother, and a Latina. I am respectfully corrected many times by those who have walked before me and from those who give me advice. I speak to our young women when making choices about being pregnant when it was not their choice. And Ms. Echaveste is correct, I do not judge; as a concerned “person,” my first instinct is to assist. This does not mean that I agree with the decision of abortion, should it come to that. I hope that those young women who ask me to accompany them to clinics for pregnancy tests and terminations change their minds, not because of my advice, but because of their own strength and because it is a decision that will affect them for the rest of their lives. The consequences of their actions, many times, are not explained to them, nor are the consequences of what can come to be a painful and regrettable decision. The access to abortions should therefore, not be the same as access to contraceptives which are preventions to a pregnancy. Abortions should be just what they are and that is a termination of a life. Irene Vilar, author of Impossible Motherhood, writes about how she used abortions as a method of contraception and after 15 abortions in 16 years, wanted to help other women not make the same mistakes. She uses this avenue to warn women about the psychological affect of repeated self-destructive behavior, when a woman is faced with the worries of having to choose her professional life and her desire of motherhood. According to Dr. Louis Wienstein, Chairman of the OBGYN Department at Thomas Jefferson University Hospital in Philadelphia, women who have multiple abortions face a potential risk for cervical damage and uterine lesions which can compromise future pregnancies. This is important information of which young women should be cognizant prior to making the decision to end their pregnancies even if unwanted. Women should be aware that their present actions will affect their future psychologically and physically state. Furthermore, Latinas are not having abortions in large numbers. Studies show that only 25% of Latino women are having abortions. This may suggest that Latina women are starting to have access to more contraceptive alternatives and understand the consequences of family decisions. Single women, having abortions tend to be white, rather than ethnic. Suggesting again, that Latinos follow their faith more than the right of abortion as Ms. Echavaste states. Latinos still have a high regard and respect for their faith whether it be Catholic or “other.” What is true among Latinos is that a life is important and that belief should be honored and respected whether the law gives the right to end it. In this regard, Ms. Echaveste is correct, Latinos are not sheep. They will not follow a trend because it is hip. They will follow that which is true in their community, family, and faith: Be honorable in your actions toward a life, just as your mother was to yours.